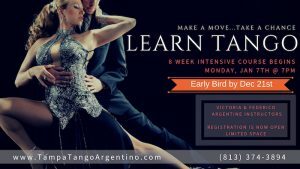 This is an 8 week Intro to tango intensive program. We will focus on the fundamentals of Argentine Tango. Hello. I’m interested in learning Tango. How does the 8 week course work? 1 class per week? Hi Hiroko – Yes, it’s one class per week on Monday nights. We have a new session starting on March 4th if you are interested.